1. Investors shrug off attacks: Global markets have reacted calmly to deadly attacks in Germany and Turkey, and a shooting at an Islamic center in Zurich, Switzerland. European markets are mostly edging up in early trading. 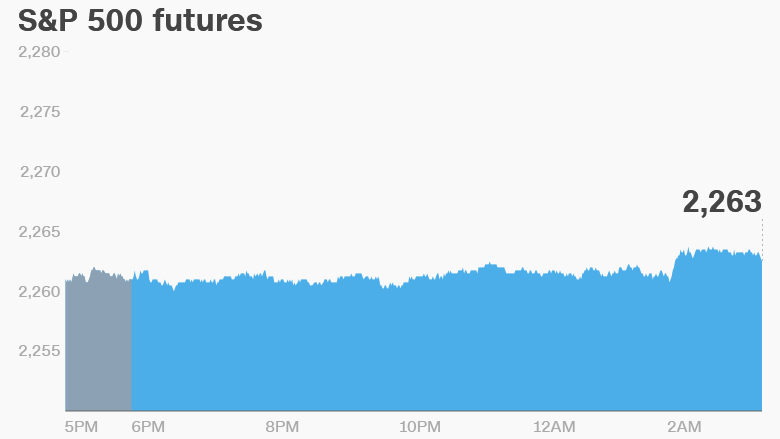 U.S. stock futures are also in positive territory. "Aside from the tragedy of the human cost, markets will consider the political implications though it is too soon to draw any meaningful conclusions in that direction," said Paul Donovan, global chief economist at UBS wealth management. The main U.S. indexes are all near record highs, which they reached early last week. 2. Banking on a rescue: Shares in Italian banks are among the best performers in Europe right now after the Italian government said that it is asking parliament to let it borrow as much as €20 billion ($20.8 billion) for a potential bank rescue plan. Italy's weakest bank, Monte dei Paschi di Siena (BMDPF), has been scrambling to raise €5 billion ($5.2 billion) from investors before the end of the year to avoid a state bailout. If the plan fails, the government is likely to have to step in with a rescue package. Shares in Monte dei Paschi are rising by about 3% as investors express relief that a back-up plan is in the works. The bank's stock has crashed by about 85% since the start of the year. 3. Earnings: Blackberry (BBRY), General Mills (GIS) and cruise ship operator Carnival (CCL) are releasing quarterly earnings before the open Tuesday, while FedEx (FDX) and Nike (NKE) plan to release earnings after the close. 4. Steady as she goes: The Bank of Japan opted to hold interest rates steady and has made no change to its economic stimulus measures. This decision was widely expected. The Japanese yen is declining following the announcement. Traders are instead opting to move their money into U.S. dollars. Correction: An earlier version of this story incorrectly reported that Friday would be a shortened trading day on the NYSE.